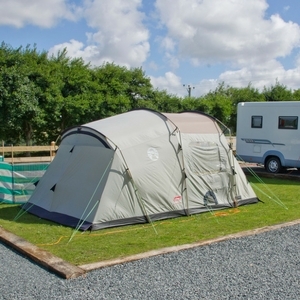 When you return to Globe Vale Holiday Park at the end of a fun day exploring Cornwall, you can rest assured our campsite will live up to the rest of your day. We have spent more than 15 years creating Tent pitches and facilities that have won us the AA’s highest rating and successive Tripadvisor Certificates of Excellence. We only have a handful of these fully serviced grass pitches, so they get booked quickly. Our Premier Grass pitches are spacious and all grass. Great if you want a large grassy space for your children to play. 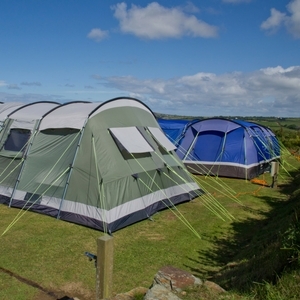 These are our most popular pitches for tent campers. The pitches on our three Premier grass fields are situated on the perimeter of the field, with the centre of the fields allowing for open space. 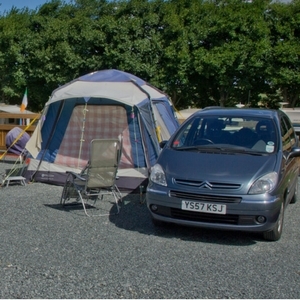 Our Premier grass pitches are well suited for families and rallies. Our fully serviced hard standing pitches range in size from 11m x 10m to 7.5m x 7.5m.